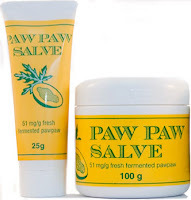 Now that winter has settled in I'm using even more of my beloved Paw Paw ointment than normal on my chapped lips and skin. All you Aussie gals who are also addicted to the stuff may not realise that the old favourite in the red tube is actually petroleum based - yuck! The packaging doesn't list all of the ingredients, but it contains up to 50% petroleum jelly (umm, greenwashing anyone?). There are conflicting reports on exactly how dangerous absorbing petroleum-based products through your skin is, but I'm since committed to a world free from polluting non-renewable resources like petroleum anyway, I'm happy to pass them by in my beauty products. 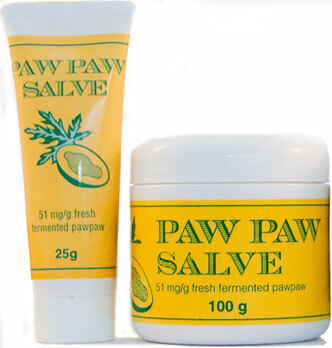 Thankfully there are a couple options on the market full of delicious, natural and safe ingredients to keep me in my paw paw habit. Now doesn't that all sound better than 50% petroleum jelly? The honey adds a nice sweet touch to the taste, too. Divine! 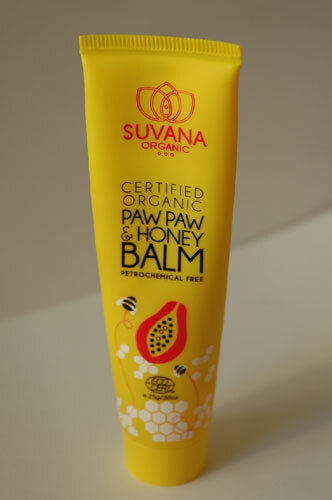 Ingredients: Fermented fresh paw paw, Rhus succedanea (summac berry)wax, glycerine, canola oil, hydrogenated castor oil, beeswax, corn starch. Not quite as delicious as Suvana, but still a definite improvement. So next time you reach for the Paw Paw, reach for the yellow ones intead - you should be able to find them in your local health food store.